Whether you’re selling groceries, financial services, or gym memberships, successful recruitment of new customers is only truly successful if they return to buy from you again. The metric which reflects this is called retention, and the approach we use is customer retention analysis. It’s one of the key metrics that influences revenue. When your customers’ retention is law, you’ll spend all of the income from your business on marketing. 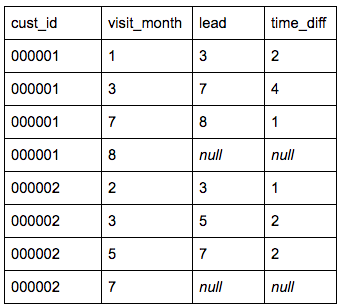 At the same time, retention is easy to improve if you can calculate it the right way using SQL and your database. In this post, we’ll guide you step by step on how to make basic customer retention analysis, how to build customer retention over time, new vs. existing customers retention curves, and how to calculate retention analysis in cohorts. Customer retention curves are essential to any business looking to understand its clients, and will go a long way towards explaining other things like sales figures or the impact of marketing initiatives. They are an easy way to visualize a key interaction between customers and the business, which is to say, whether or not customers return — and at what rate — after the first visit. The first step to building a customer retention curve is to identify those who visited your business during the reference period, what I will call p1. 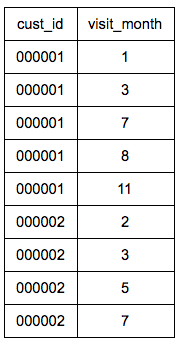 It is important that the length of the period chosen is a reasonable one, and reflects expected frequency of visits. A supermarket may choose a longer period, perhaps 2 weeks or a month. In the following example, I will use a month, and assume that we are looking at customer retention of customers who visited in January 2016 over the following year. 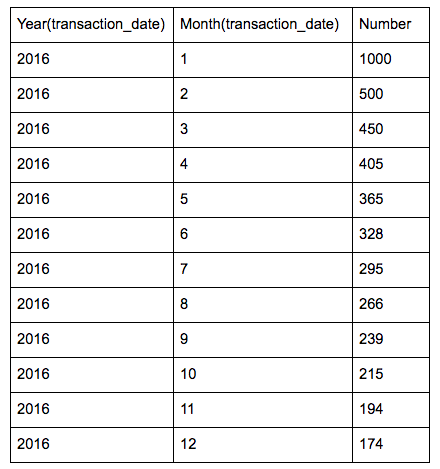 Then, we look at how those customers behaved over time: for example, how many of them returned per month over the rest of the year? As you can see, the original SELECT function is included in this second step. What is described above is obviously only the first step, as we would also like to see whether there are any trends in customer retention, i.e. are we getting any better at it? So, one idea we might have is to say: of those who came in January, how many returned in February? Of those who came in February, how many returned in March? And other one-month intervals. So, then we need to set up an iterative model, which can be built in a few simple steps. First, we need to create a table where each user’s visits are logged by month, allowing for the possibility that these will have occurred over multiple years since whenever our business started operations. I have assumed here that the start date is the year 2000, but you can adjust this as necessary. We then need to reorganize this information in order to identify the time lapse between each visit. So, for each person and for each month, see when the next visit is. Now, a small reminder of what customer retention analysis measures: it is the proportion of customers who return after x lag of time. So, what we want to do is compare the number of customers visiting in a given month to how many of those return the next month. We also want to define those who return after a certain absence, and those who don’t return at all. 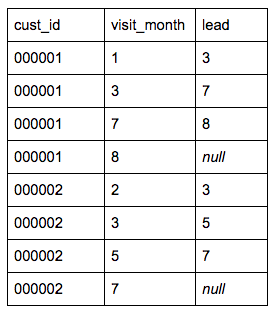 In order to do that, we need to categorize the customers depending on their visit pattern. This will allow us, in a final step, to establish a count of the number of customers who visited in a given month, and how many of those return the next month. This gives us, month by month, the proportion of customers who returned.